A cozy garden with a gazebo, green lawn with pooland the beach, blooming flowerbeds, garden, pleasing the rich harvest - the owner of all that you can be, if you buy a piece of land. However, the nature of ownership require care and attention. If the first time you will get the pleasure of dashes with a bucket and watering plants, then eventually you get tired of such a duty. This is normal. Sooner or later, any landlord comes up with the idea that such a mission will cope admirably automatic irrigation system. Plan - is the starting point, because to ensure theautomatic watering area will have to invest a lot of works. However, you want to "base" from which you will "dance". After all, you need, first, to purchase equipment (and before that, to calculate what and how much to buy), and secondly, a list of work to understand how much time and effort the process takes, whether you can handle it yourself. It's important to know! 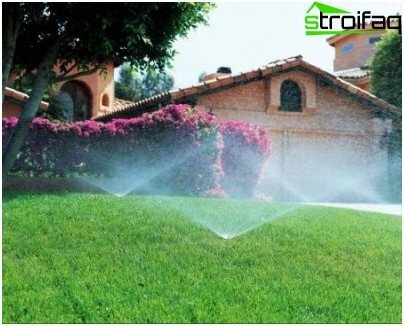 Experienced landlords recommend draw irrigation scheme as soon as you have purchased a lot, so you do not spoil the crops and not to disturb the harmony of the landscape. Where to begin? Take an ordinary drawing paper (or as it is often called - graph paper), put on a piece of the house and other buildings in the area (gazebo, patio, children's playground, swimming pool, well and so on), track area grill - all this you will not have move to another place. It should also be applied to the layout plan and planting areas, but if you have nothing planted, it will be possible landing place, taking into account the future of irrigation system arrangement. First, mark the location of water intake and homepumping station. 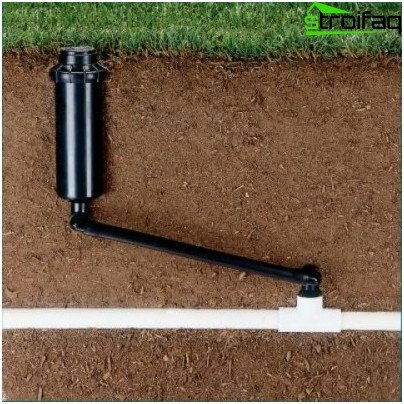 Ideally, if the water flow comes from the central portion, while irrigation line are of equal length, which means that the water pressure within the system will be uniform, therefore, your vegetation is watered uniformly. From water source locations along the perimeter drawn pipe and its branch, which is counting on finding sprinklers (sprinklers). the last number depends on the radius of their action. If you plan to buy sprinklers with a radius of, for example, 25 m, then on the layout diagram you need a compass to outline the coverage of each of the sprinklers. 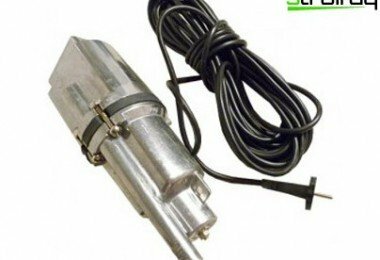 To all the groups need to install watering heads solenoid valves. Plan Example, you can see in the photo below. As you can imagine, all the buildings and areas whereundesirable ingress of water should not fall into the range of action of sprinklers. Then, automatic irrigation scheme is transferred directly to the territory. To do this, make a layout using pegs and string. As the stakes you can use the handy improvised material (plates, welding electrodes, and so on). Cord better purchase polypropylene, colored or white - are "beacons" are reliable and can be seen from afar. The layout expose some distance from the proposed location of passage systems and see that the path was not rocky areas, otherwise you have to then adjust the laying plan. 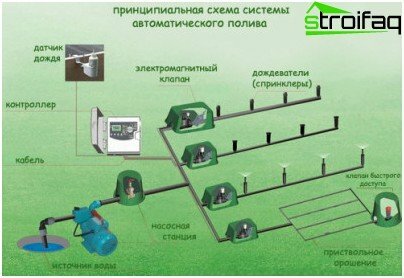 As you can see, the system of automatic watering with their hands - it's not prohibitively difficult project you can think of before, although time-consuming, requiring the attention of the block. The plan is ready, the marking is done, the materials purchased, it's time to install automatic watering the garden. Get ready for the next phase of work. Attaching the component parts of the pump. Mounting controllers motion regulators, solenoid valves and a filter. 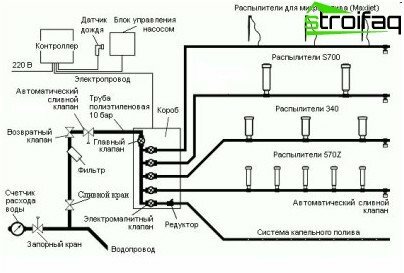 Commissioning and start-up of the system. 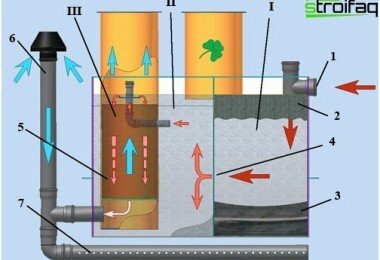 In general, the procedure set out work briefly, butclearly describes how to make automatic watering, but some process steps still need a more detailed description. What is the depth of the trench need? Professionals say that the ideal depth of the trunk and its branches - 1 meter. 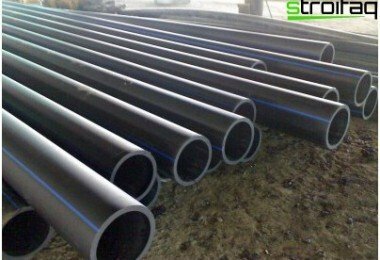 Then, the pipe will be located below the area of ​​soil freezing. 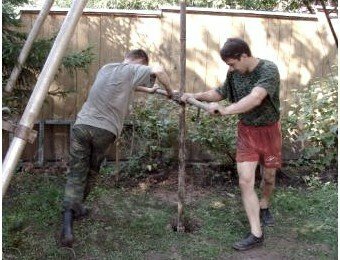 Of course, such work is labor-intensive, so you can enter, as well as many amateur gardeners, and dig a ditch depth of about 30 cm, roughly speaking, a little more than a bayonet spade. But do such a deepening is necessary with some slope and install drain valves at points below the rest. Why do it? To drain all the water from the pipes before preservation system for the winter. 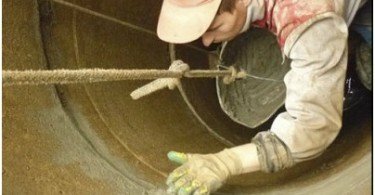 Joining pipes, valves and other components of the highway it is recommended on the surface, and then the finished pipe is laid in a ditch. 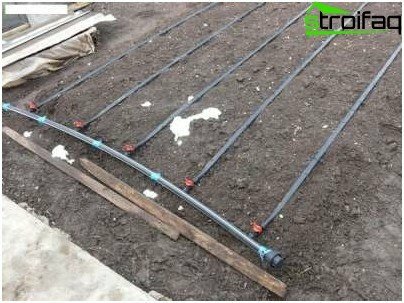 Next, make sure the system for leaks, then you can wind the sprinklers and fill the trench with soil. 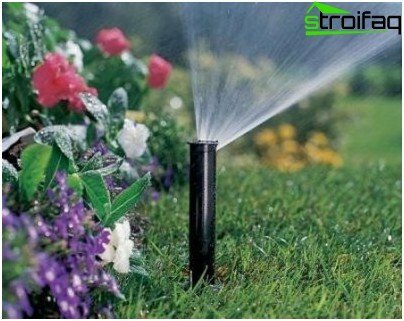 It remains to adjust the direction of irrigation sprinklers, and turn on the water. humidity sensors and rain in winter move to store in a warm room. frequency of use of the system, no doubt, dependson many factors (such as weather and the type of plants), but stick to the established norms, for example, the lawn should be watered every few days and not less than 1 time in 7 days. 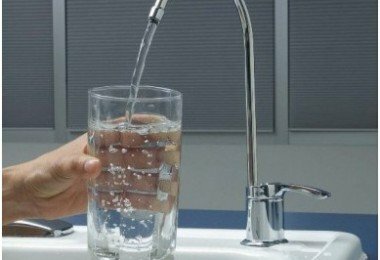 Now that you know how to make automatic watering their hands, therefore, correctly decide whether to engage in such work unit you own or turn to professionals.